Heat rash relief and perfume. For most of my life I’ve struggled with my weight. In highschool and my early twenties I did all the fad “diets,” I still shudder when I think of cabbage soup…I developed a thyroid condition, suffered from chronic pain, heart palpitations, nausea, and poor vision…plus my weight kept going up. I was doing everything my doctors, the media and my mom told me to but I kept gaining weight. Fast forward a decade and you have a very overweight 30 year old housewife. I’m not going to write about wright loss today, although you should read nourishing traditions if you are struggling with health and weight issues. Today I’m going to talk about one of the irritating side effects of being fat…heat rashes. My poor husband can attest to the fact that I have been suffering horribly from heat rashes for the past several months. I made a special blend of essential oils to help, but it only helped a little. 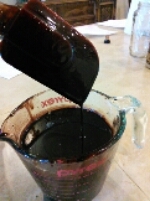 I had mixed the oils with a carrier oil…which is not ideal for heat rashes. Last night I had a TADA moment. Why not make a spray. But how was I to mix oils with water??? As usual Mr. Google provided an answer. Alcohol! This spray is marvelous. It cools and soothes the heat rash instantly, and it dries super fast so there is no moisture issues. As a plus it smells so good that I’ll be using it as a perfume AND a linen/room spray. Talk about multi purpose. As a heavy woman this is a necessity for me, but it will obviously work for men, skinny women and teenagers who suffer from heat rash. Also please note, I’m not a healthcare professional, this is just how I personally treat heat rash and you should use your own judgment when taking advice from somebody on the internet. Mix oils and vodka, fill with water shake. Done. Its that easy. You can adjust to make it weaker or stronger. I wouldn’t use this on children under 2 or on anything that would come into direct contact with their skin. If you want something for children use lavender only. 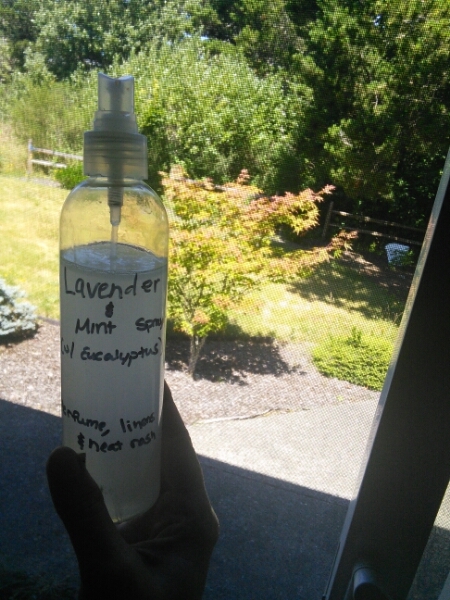 Eucalyptus and mint may cause respiratory issues in infants. My grandma’s A-Z bread has always been my favorite baking recipe. Period. It makes THE best banana nut bread ever. THE best zucchini bread…the best carrot raisin bread…the best apple bread. You get the picture. One day I ran out of baking soda, and after a suggestion from Mr. Google I substituted extra baking powder and suddenly I had the best muffin recipe too!!! I’ve been searching for a good from scratch corn bread recipe, for some time now. It, finally, dawned on me to try grams’ A-Z bread…BINGO!!!! 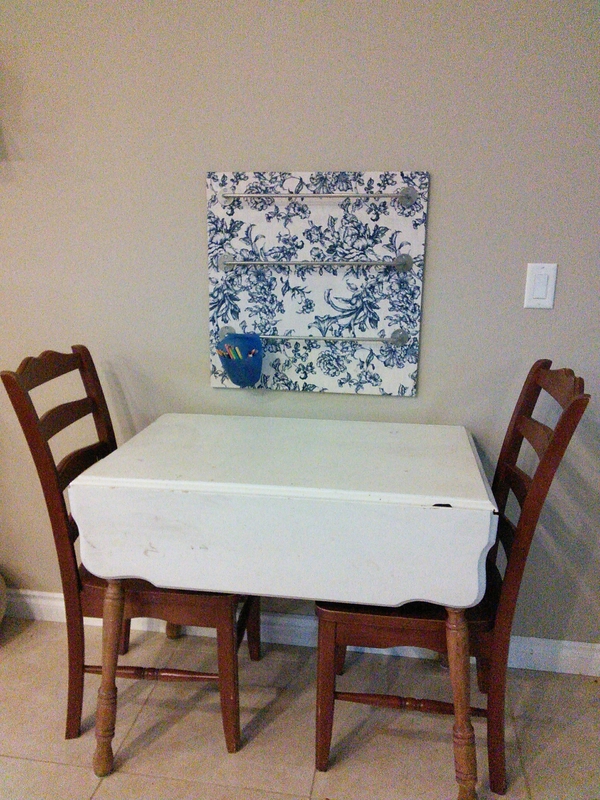 I altered it a bit, but it was a good starting point. Mix all ingredients together. No need to do wet and dry, just start at the top of list and work your way down. Bake in muffin pan, until tooth pick comes out clean. 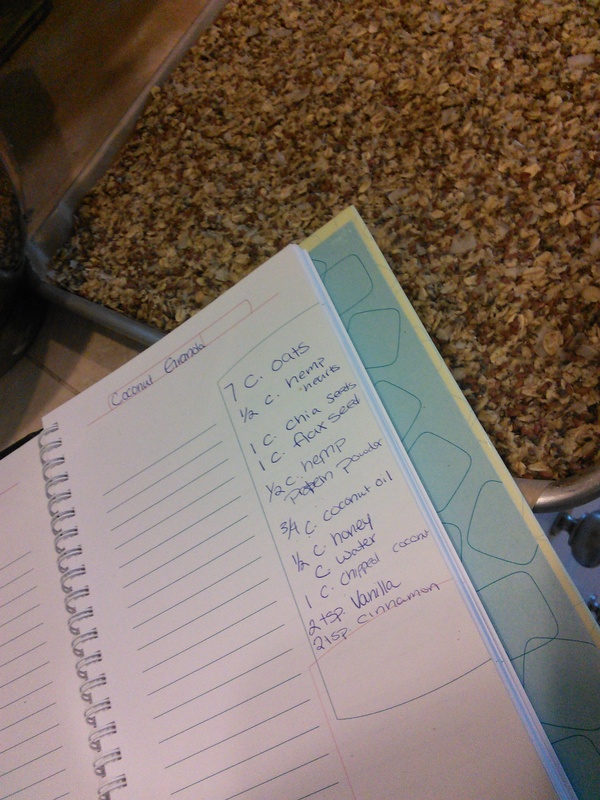 This my granola recipe, its a very delicious work in progress. 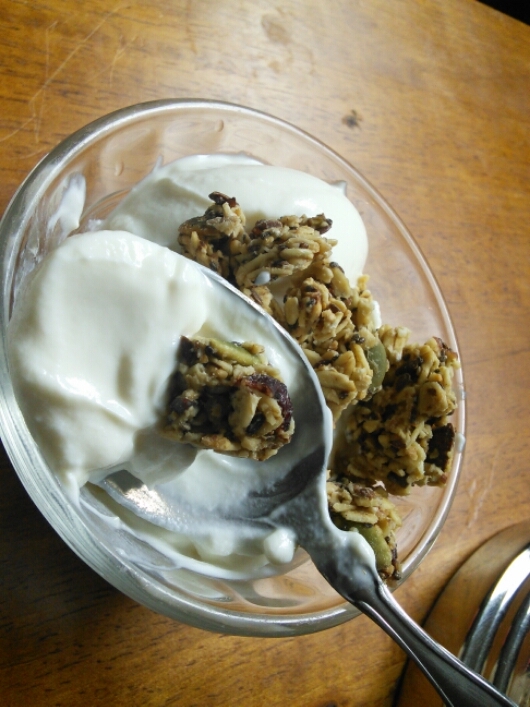 Basically granola is oats, moistened, sweetened, with oil and slowly dehydrated or baked. I like the addition of chia and flax for the wonderful health benefits, but they also help hold the granola together due to their gel like substance they make when wet. 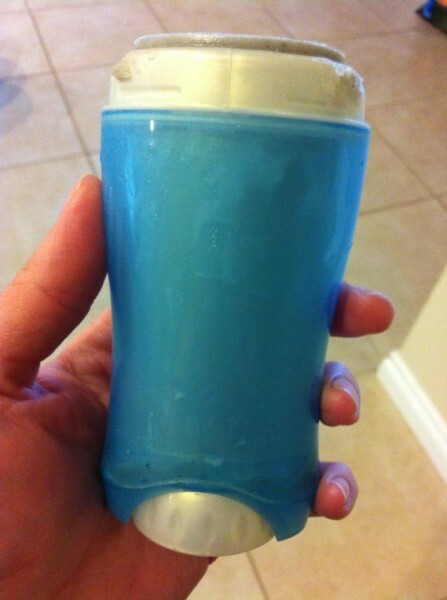 When this gel dries it acts like a glue. *optional, raisins, craisins, pine nuts, pumpkinseeds, sunflower seeds etc. Mix all dry ingredients (fits perfectly in a kitchen aid mixer) until all ingredients are well distributed. Stir all the wet ingredients together (your coconut oil will need to be melted) then slowly pour into the dry ingredients. Line a sheet pan with parchment paper. Dump the granola onto the sheet pan and press/smooth into one thick layer. You can precut bar shapes if that’s what you are using it for. Bake at 175° for 4-6 hours, until dry. A dehydrator would work even better, but alas I don’t have one…yet. 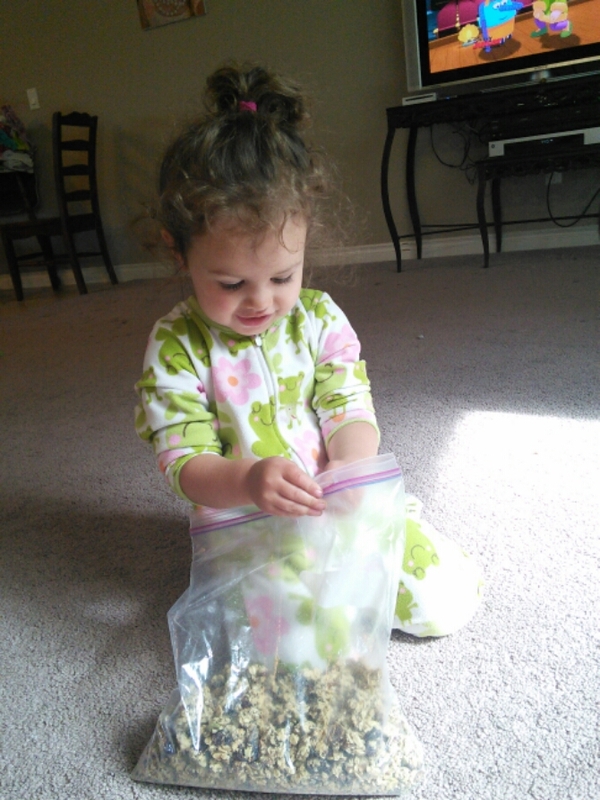 This batch had craisins and pumpkin seeds…..
As you can see its a big hit! Sometimes I realize I spend all together too much time alone with myself and 3 small children. Today I found myself cackling to myself when I realized I could clean my big old windows without a ladder and without moving my couch (which would add a few minutes as I’d have to clean under the sofa as well…). All I had to do was use my swifter…duh. Forgive me if I’m late to the game with this idea, but for me its a game changer! I’ve developed a deep and abiding love for walnuts, late in life. So one day when I had some bananas that needed to be eaten I decided to try for banana pancakes and then wham…it hit me walnuts…and brown sugar and crunchy and OH my I had to try it. They are SOOOO good. add banana, walnuts and then sprinkle with brown sugar. Be careful when flipping as it can fall apart.